April 18 is National Animal Crackers Day. If you loved them when you were a child, then you have to celebrate this holiday. 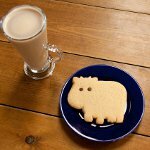 The first animal crackers originated in England, where they were called animal biscuits. In the end of the 1800s biscuits were imported to the USA. The demand for crackers rose so quickly, that bakers started producing them at home. Production of animal crackers in the USA began in 1871 in York, Pennsylvania. Other bakers united under the National Biscuit Company to produce their own animal crackers. Eventually these crackers became known under the name Barnum's Animals, and its first box appeared in 1902. Barnum's Animals featured 37 different animals since 1902. The most recent addition to the collection is the Koala bear. The common variety of animal crackers is light-colored and slightly sweet. There are also chocolate and frosted varieties available, but the common ones are the most popular. Animal crackers are made with the same layered dough like crackers, but they are sweet, like cookies.